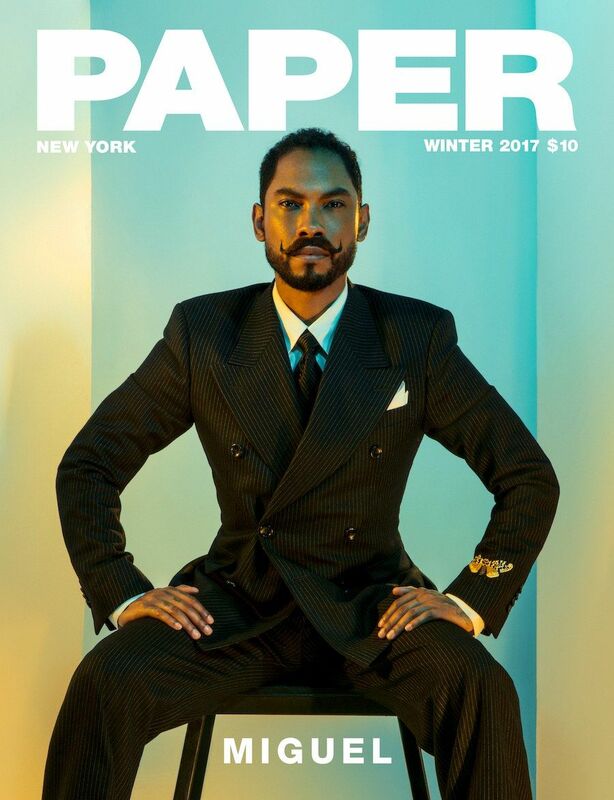 In the following photos, Miguel channels surrealist master Salvador Dalí, recreating iconic portraits of the legendary artist as well as "In Voluptas Mors," Dalí's striking collaboration with photographer Philippe Halsman. In a time when even the smallest action can feel political, many artists are having to decide whether to make work that's responsive to our current environment or separated from it entirely -- and if the latter's even possible. With his newest album, War & Leisure, Miguel finds himself negotiating this challenge and making music that addresses the surreal realities of our age, where our social media feeds depict the all-out pursuit of pleasure while our headlines warn us of nuclear annihilation. 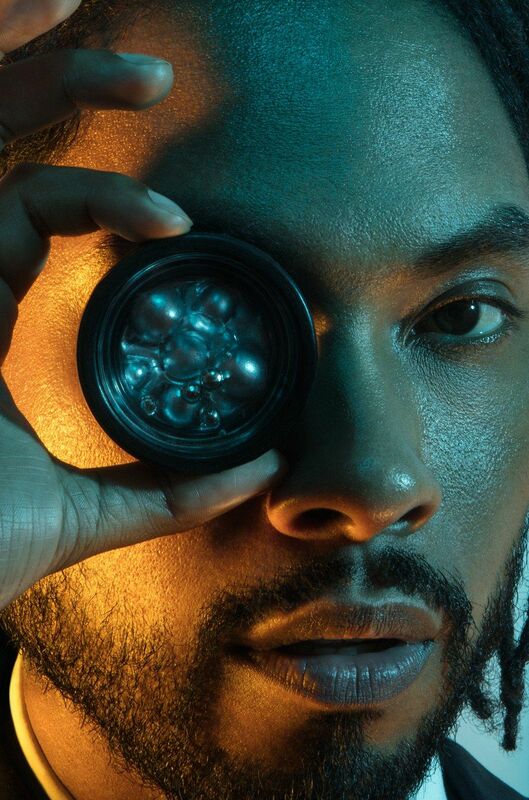 After finding runaway success with his first three albums -- and his Grammy-winning single "Adorn" -- Miguel cements his status as the ultimate mixer of R&B, funk, electronic, pop and rock with this latest record, perhaps his most dynamic and upbeat album yet. We caught up with the 32-year-old singer to discuss War & Leisure, out tomorrow, and the role of the artist in times of sweeping change. Where did the concept for War & Leisure come from? It's been in the back of my head for some time. I think it was understanding my body of work and trying to make heads or tails of it. I just felt an overwhelming sense of inspiration that's pulling in opposite directions, on every level.When I really sat down to think about what those opposing forces were, that was my best way to describe it. Your artwork imagery so far is military-themed, the album is titled after war and in October you performed at the Adelanto Detention Facility to advocate for immigrant detainees. The most recent election was a wake-up call for a lot of people, but were politics something that you've always been engaged with? I wouldn't say that I'm super involved in politics even now. I think War & Leisure in general is more about, not even the political aspect but just energy. It's what's permeating my reality, it's what I feel and what I'm experiencing. I am more aware of what's happening politically, socially and whatnot. I'm a lot more sensitive to it now. But I wouldn't say this is a political album. When you're talking about the energy that you feel around you, do you mean in your personal or creative life, or more literally the events happening around you? On a literal level like, it is true, it feels like we are very close to being on the brink. It's looking at things for what they are, and how some of the people in power are throwing the notions of this kind of war out there into the ethos and into what's on our collective radar.The things that we're seeing and hearing about are definitely an influence. But I think that even on a personal level, all of us at this point have to make our own decisions every day on whether or not we want to fight to do what we love in a world in which sometimes things are not in our favor. And it's not easy for anybody. Everybody has to wake up and fight their own battles just to stay positive. And that's, I think, a bigger part of where the war energy is coming from, but I would be lying if I said it didn't have anything to do with what's happening in our real future possibilities via what we're seeing on the news. It is a part of that, but I think it's kind of the collective, all of that energy.We're all just trying to figure it out. We're in the middle of a lot -- a lot of completely opposing messaging and narratives. What do you feel your role as an artist is in all of that? The album is a good representation of what's occupying my mind in this space and time. Because I want to be an artist whose personal life is really reflected in their music, if I didn't include some of the things that are happening in the ethos and the things that I'm seeing and paying attention to and that I care about, if I didn't include those topics in my music, I think it wouldn't be a real, honest representation. Where do you feel this album fits into your body of work? It's definitely a more upbeat album, ironically. I like contrast. It makes the world interesting. You can see that in my aesthetic as well. If you listen for the feeling, and I listen to music for feeling sometimes, and then you go back and listen to the lyrics, there's other layers there to be revealed. I think there's a lot of dynamic there for my fans to really grab onto and appreciate. War & Leisure is kind of the ultimate contrast. One hundred percent. More than anything, as an artist in the now, music is becoming an exercise in consistency. So for me, it's like, yes, this is a body of work, and I'll continue to make bodies of work, but I think I just realized in the past year that it's just important for creative people to continue to create and give as much of that as possible.